In addition to his research duties, Joseph will work with UGA Cooperative Extension agents and will teach an entomology laboratory course for UGA students enrolled in the plant protection and pest management master’s degree program. 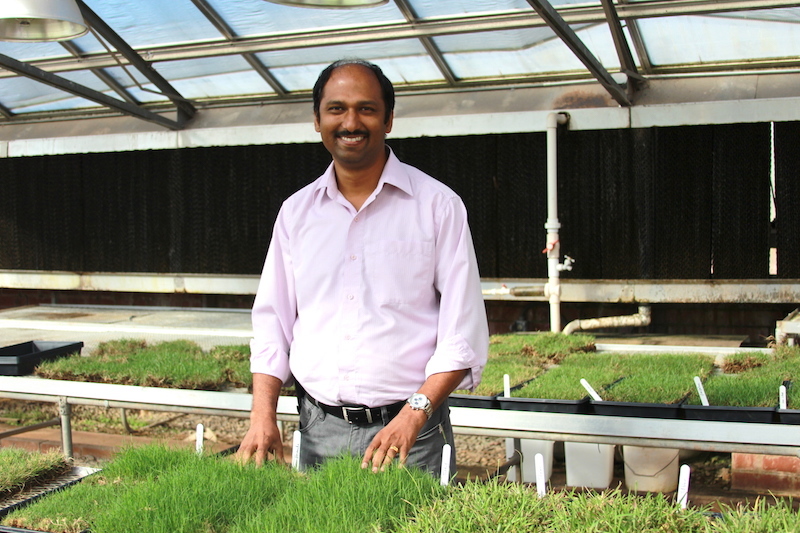 A native of India, Joseph came to the U.S. after graduating from Kerala Agricultural University in Thrissur, India, and operating his own consulting company. “I stayed connected to the university while running my business and then I decided I wanted to know more about agriculture so I could better help growers,” he said. In 2004, he began working on his master’s degree at CAES, conducting research under Braman. Joseph studied host plant pest resistance in zoysia, Paspalum and Bermuda grasses. He also surveyed 13 residential turfgrass lawns for pests. Joseph worked with Jim Hanula, then a UGA Warnell School of Forestry and Natural Resources professor, while pursuing his doctorate. With Hanula’s guidance, Joseph studied the hemlock woolly adelgid, a forest pest of hemlock trees. Joseph monitored the use of predator beetles to control the insect. He also studied host plant resistance in Chinese and Carolina hemlocks. In 2010, Joseph began a postdoctoral assignment working alongside CAES Professor David Riley on the UGA Tifton campus. There, he studied thrips damage to tomatoes and peppers. He then left Georgia to begin another postdoctoral assignment on the brown marmorated stink bug, this time at the Virginia Technical Institute. At the time, the pest caused $37 million in losses to the apple industry along the East Coast, where it is a major pest of fruiting crops, including apples, peaches and nectarines. He developed management strategies and monitoring procedures, and he determined the timing schedule for application of fruit protection in the orchards. He then spent what he refers to as “five really busy years” at University of California Cooperative Extension where served as an IPM advisor, a position similar to that of a county Extension agent. He worked closely with growers in the state’s Central Coast region. “I helped with pest issues in brassicas, lettuce, strawberries, blackberries, raspberries and artichokes,” he said. Over the years, while he gained more knowledge and experience in the field of entomology, Joseph kept in contact with his UGA colleagues through the Entomological Society of America. He heard about a UGA position opening at a society meeting and pursued the opportunity. For more information, visit CAES News Wire.